According to The Pulse Of Radio, GUNS N' ROSES guitarist Slash is apparently losing his patience with the ongoing negotiations over his divorce settlement with his estranged wife Perla Ferrar. Slash reportedly wants Perla to sign off on their final agreement, while Perla has accused her former husband of hiding money and refusing to turn over financial documents. The Blast obtained the latest batch of filings, in which Slash's legal team shoot down requests for him to sit for a deposition, claiming that Perla "continues to drag her feet" and did not respond to legal requests for months at a time. They also explain that she's owed a $160,834 payment but has not received due to her own fault in timing. Slash also claims that he had to cover the late payments to one of their children's cars, a Mercedes 450, because Perla allegedly failed to make the payments. He states that he was "forced to pay these overdue lease payments to prevent embarrassment of the car being repossessed." 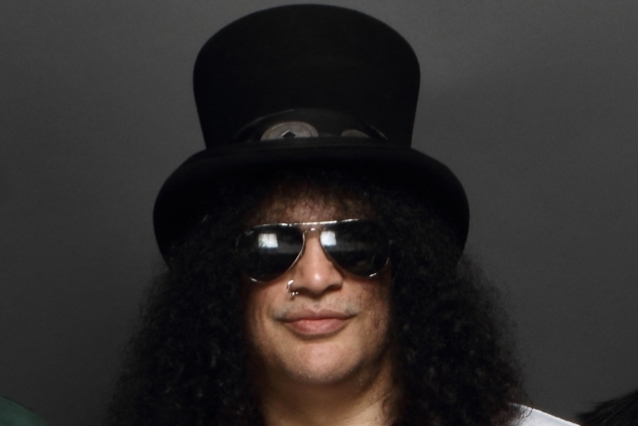 Perla's legal team, meanwhile, claims that Slash earned $45 million in 2017 and allege that the only reason the rocker's team is refusing to hand over financial documents is because he has been "manipulating the income that he will earn in the future that could affect his future support obligations." The judge has yet to rule on the claims and requests from both sides. GUNS N' ROSES' "Not In This Lifetime" trek, which reunited Slash, Axl Rose and Duff McKagan, launched in 2016, and recently made its way through Europe.